The incarnation -- God becoming man -- finds an appropriate response in celebration. This is the response of two groups who hear the glad announcement on the night of the God-man's birth. Glory to God in the highest, and on earth peace among men with whom He is pleased. The shepherds went back, glorifying and praising God for all that they had heard and seen, just as had been told them. A multitude of angels and a band of shepherds do what we all should do at this news: Celebrate. God has become man. Let us celebrate. The Creator has become a child. Let us celebrate. The Son of the Most High has become a male infant. Let us celebrate. The Almighty God has become a needy baby. Let us celebrate. God is with us. Let us celebrate. God has come to show us what He is like. Let us celebrate. God has come to serve us. Let us celebrate. God has come to save us. Let us celebrate. And in celebrating, may we follow the example of the angels and shepherds. How did they celebrate? By glorifying God, Luke says. As we near Christmas, may we celebrate and glorify God for the most important development in human history that leads to the central event in redemptive history: God became man, a man who came to "save His people from their sins," as the angel tells Joseph in Matt. 1:21. 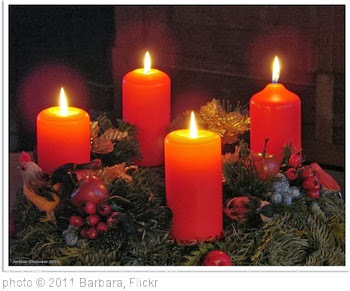 Because He is God in the flesh, the Savior, and the Risen and Ascended Lord, we await another advent. As we celebrate His first coming, may we encourage one another to look forward to His second coming -- an advent which will begin a celebration for His people that will last forever. The greatest development in human history is simple in its presentation. With that no-frills description, the Bible reports the incarnation. God comes in human form. Hidden within the simplicity of the description is unfathomable truth. This baby is fully God and fully man. The Creator of the universe becomes the child lying in a feed trough for animals. This seems impossible. Yet, it is true. [T]he Almighty appeared on earth as a helpless human baby, unable to do more than lie and stare and wriggle and make noises, needing to be fed and changed and taught to talk like any other child. And there was no illusion or deception in this: the babyhood of the Son of God was a reality. The more you think about it, the more staggering it gets. Nothing in fiction is so fantastic as is this truth of the incarnation. This is what Christmas is about. God the Son humbles Himself to become a man. Yet, this embryo who becomes a newborn who becomes a boy who becomes a man maintains the deity He possesses as God. The incarnation -- God the Son willingly humbling Himself to become a man -- is for the purpose of a humiliation that makes Christmas all important. God the Son suffers and dies in the place of sinners that they might know His Father. He lives righteously as a substitute for us, then dies sacrificially as a substitute for us. It is a work He only could perform through His incarnation. And as we anticipate Christmas and its truth of God putting on human flesh, we also look forward to His second coming -- when we will see Him in the glorified body which He now possesses. God not only makes promises and provides foreshadowings in many ways to build expectation for the coming of the Savior. He also declares His Son's incarnation when it is time for the expectation to become reality. He makes declarations to two human beings who are waiting expectantly for the Messiah but who have no expectation of how dramatically His coming will affect their lives. Centuries of expectation are at an end. The hopes of the people in the promises of God are fulfilled. They are met in a divine embryo. The Savior of the world miraculously resides in a virgin's womb. A poor Jewish couple awaits not only the delivery of a first-born son but the appearance of the only One who can deliver them. The world, largely unsuspecting, awaits the greatest moment in human history -- God will appear as a man. The baby now hidden will soon emerge the way others do, but He will come forth as "the Son of the Most High" to "save His people from their sins." Joseph, Mary and the world await His first coming. We await His second coming. Advent is a time for remembering the declarations of God regarding the coming of the Savior in His humble state long ago. It also is a time of remembering the declarations of God regarding the coming of the Savior in His glorious state over a kingdom that "will have no end."